Feral cats are cats that are not socialized to humans, and often live in colonies. Most are not socialized enough to be placed as a typical pet, but can still live and thrive outdoors, provided they have adequate food and shelter, and have been spayed/neutered. 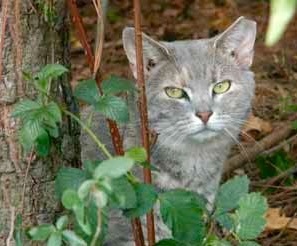 Our feral cat program focuses on “Trap-Neuter-Return” (TNR), which has proven very successful in reducing the cat overpopulation problem in our communities. This consists of humanely trapping said cats, getting them to a vet, having them sterilized and vaccinated, and returning them to their original territory after recovering from the surgery. Increasingly, and unfortunately, there are quite often friendly, stray cats that show up at feral cat colonies. In these cases, we strive to rescue these cats and place them into adoptive homes. The term “community cats” encompasses feral cats, and domestic cats who have been lost or abandoned. We provide assistance and education, trap loans, and in some cases vouchers for feral cat sterilization. In addition, we can help caregivers of the cats with food and outdoor cat shelters.